Genius! That's the only word that can describe Coca-Cola Co.'s "Cap the Tap" program, which urges restaurants to push soda and other profit-making drinks instead of water. As reported recently by the blog Civil Eats, Coca-Cola has pitched this plan to restaurant managers on its Coke Solutions Web page: "Every time your business fills a cup or glass with tap water, it pours potential profits down the drain. The good news: Cap the Tap -- a program available through your Coca-Cola representative -- changes these dynamics by teaching crew members or wait staff suggestive selling techniques to convert requests for tap water into orders for revenue-generating beverages." Bravo Coke! But I'm puzzled that you've apparently wiped mentions of Cap the Tap from your website since the report surfaced in November. 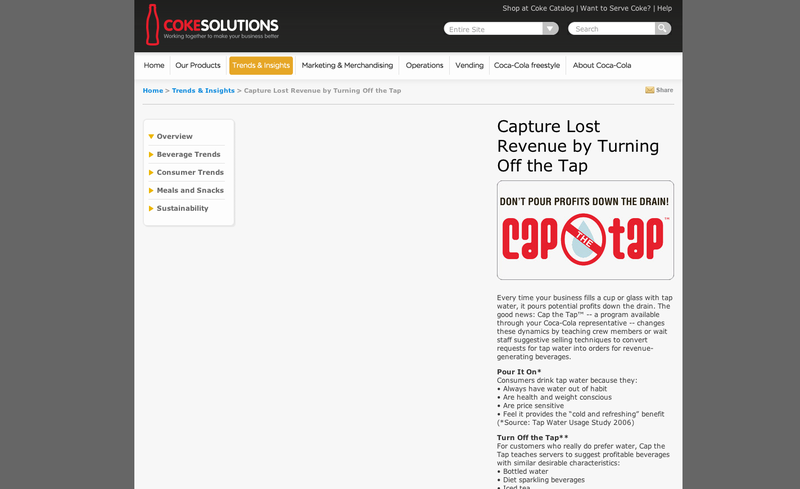 Now is the time to expand the genius of Cap the Tap, not suppress it. To anyone who complains that sodas and junk drinks are the primary source of added sugars in the American diet, I say: "Downer!" Here are some other programs Coca-Cola can start to maximize profits and minimize health. -- Anne Stuhldreher Anne Stuhldreher is a senior program manager at the California Endowment, a statewide philanthropic foundation that aims to end health disparities in California.